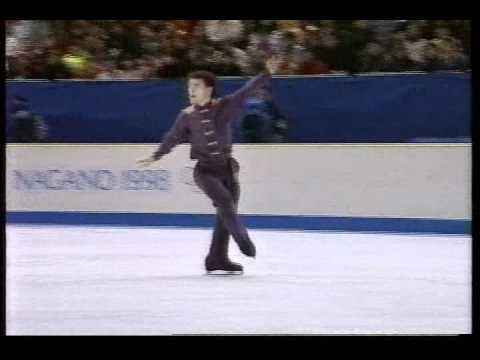 Nagano, JAPAN – 1998 Winter Games, Figure Skating, Men’s Free Skate – Elvis Stojko of Canada pulled a groin muscle in practice in January but kept silent about the injury. It would prevent him from being able to land the quadruple jump. However, his sheer determination and adrenaline would help him finish the Free Skate cleanly. He would place 3rd in the Free Skate and end up winning the Silver Medal. Elvis would aggravate the injury, tearing a groin muscle (you could hear him mumble in the Kiss N Cry, “I tore it”). He would never skate the same after suffering this injury as he would lose the consistency he developed in landing the quadruple jump. It seems to me that Elvis had ONE really great (artistically) perfomance- on 1994 worlds (not Olympics). That program was amazing and suited him perfectly. And was inspired and executed perfectly. Really mesmerising. Better that the same program on 1994 Olympics. You can tell he was in pain and concerned when he took the ice. He just powered through somehow. What an amazing performance. I really miss him and his style. I hate guys guys pretending to be girls pretending to be guys. My fav ice skater of all time! He was just amazing!!! You could tell as the second he finished, he knew he probably wasn't going to win. Even if he had skated perfectly, with his second mark would not have pulled him over Kulik. It was pure courage and strength that he was able to do what he did out there. He deserved that medal. I still can't believe he went through all this with a groin injury. The jumps, the spins, the choreography kept intact… Amazing. This was 16 years ago, but it's still interesting to see patterns in judging. I reviewed Ilia's program, and I do not think his spins or footwork were as good as Elvis. Artistically they were about the same, just very different styles. However, Ilia landed the quad and looked a little lighter on his feet on some of the other jumps. Overall, I'd say this was close even if the judges didn't think so. We'll never know what the judges would have decided had Elvis landed the quad. ADEAL's comment explains the situation. Ilia was no Pleshenko. He wasn't really that impressive or entertaining. He just landed the quad and the judges liked his more traditional style. If Elvis would have landed the quad, this would have been close, even if the judges swayed toward Ilia. Even Scott thought this was a close contest. Hey i do not know how well you are skating at all through these videos and also doubt whether you have ability to Judge in skating or not. You jsut an old skater who does not know that skating is combination of art and skill. The judgement for someone is not simple and easy. Do not skate on thin ice, Sochi Olympic! I remember when I saw this it was clear something was wrong, because he definitely wasn't skating with the fire he normally could. And my mother, who didn't know anything much about skating, walked into the room near the end of his program and simply said, 'He looks too tense, I think he's hurt.' Sure enough when he finished and that look crossed his face, it was clear. I agree with all you say. Stojko should have won in 1994. Here? I think Kulik deserved to win. The European judges preferred more classical style. It's their culture. I'm still impressed that Stojko was able to get through his program. Plus, no, this was not Elvis's best program even if he hadn't been hampered by the injury. It was still very solid and entertaining, but in my opinion, he never topped his "Dragon: The Bruce Lee Story" routine from '94. THAT he should have won with….. Unfortunately probably not. Look at the second marks. The judging panels which were heavily European based never warmed to Stojko's unorthodox, martial-arts based style. Even with Kulik landing a quad and Stojko not, 6 of th 9 judging actually had the two tied on the first mark. It was the second mark that made the difference. And Kulik wasn't even one of the truly breathtakingly artistic Russian lyricists, but they still preferred his style to Elvis's, which is a real shame. Stojko didn't like to talk about things other than his skating, he also had the flu, but to him the only thing that mattered was the competition. He was probably the toughest athlete mentally and that's how he kept his focus. I do agree this was his downfall, he was able to skate and was still pretty good, but he wasn't the same Elvis as before. Would he have beaten Kulik if he wasn't injured? That's hard to say. What are you talking about brah? getrealandsee… a thinly veiled attempt to trash Kwan again I see. it is getting boring. Agreed. It was going to be very tough to beat Kulik even in perfect condition and it's so sad to see him limp off the ice and to not even to be able to skate to the podium. Even though he did a great program, by not being able to do the quad he lost his major bargaining chip that could have given him an edge over Kulik. Still, Scott said it best: he is so tough, physically and mentally. Yagudin fell apart because of his illness while Elvis won a deserved silver. What a competitor.